*No. You didn’t read that wrong. That’s what the headline says. A black man was detained while walking down the street…with no problem. Charles Harell is the brother in the video. And it certainly looks like all he is doing is walking down the street, sipping on a cup of java, in what appears to be morning. But he’s having a conversation with us via his phone. We hear him describing a day-in-the-life of a black man in his city of residence: Cincinnati. It isn’t until a moment later that we began to realize what he is truly referring to. The cop that has been following him the entire time. Watch the video at EURThisNthat. 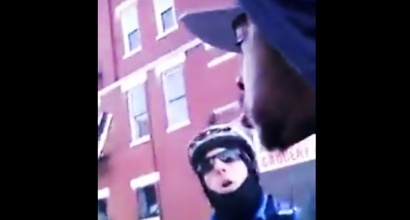 I watched the video, and this black man is tired of being harassed by white KKKops. I get it, because these creepy KKKops are out of control. The profanity, and boisterousness that you hear from this young man is due to the frustration of having to deal with these racist swines. I don’t recommend that anyone use this type of language when confronted by a KKKop, because it will only serve as a distraction for the trier of fact when you file your cas. Unfortunately, a lot of the members of the judiciary do NOT understand this kind of frustration, and will side with an officer involved with incidents like this. However, the young man is paranoid about being followed by this KKKop for good reason. He did NOT commit a crime, and should NOT have to be forced to have an encounter with this police officer at all.